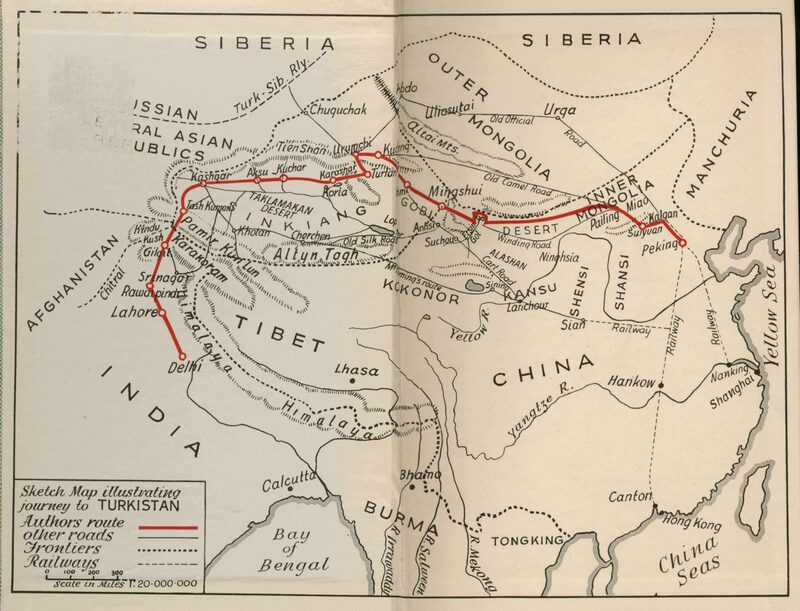 This map, which can be found in an appendix to Journey to Turkistan (1937), shows the British Consul Eric Teichman’s motor route from Beijing to Kashgar in 1935, as he travels through Mongolia, Eastern Turkestan and India on his way back to Great Britain after having served as the British Consul in Beijing. Together with another map showing the author’s complete travel route from Beijing to Delhi, this map is a complementary document to Teichman’s travel journal containing comprehensive descriptions of roads, distances, and means of transportation used when crossing different types of terrain in Central Asia. Rivers, streams, springs, passes, deserts, and mountainous regions are indicated, and names of regions and of towns and villages along the motor route are provided. The railway between Beijing and Suiyuan is visible to the east of the map. 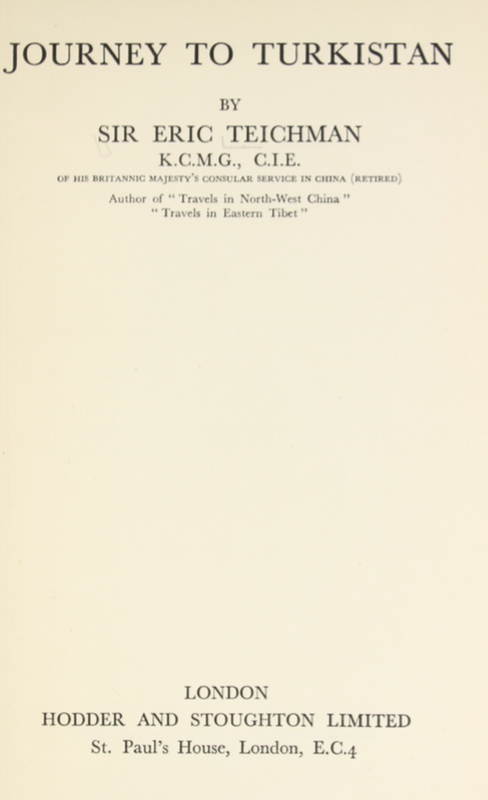 Teichman’s motor route starts from Suiyuan, from where he drives through Hami, Turfan, Karashar, Korla, Kuchar, Aksu and Maralbashi to his final destination, Kashgar. Along the motor route the quality of the road is indicated with the numbers 1, 2 and 3 representing good, fair and bad roads. Westward from Suiyan the Chinese roads are judged to be good roads, until about 800 miles from Suiyan, in the Gobi Desert, the motor route becomes fair and bad.